Residents created the Town of Fort Myers Beach (FL) in 1995 to take control of land-use decisions from Lee County. Spikowski Planning was the lead consultant in preparing an entirely new comprehensive plan. The complete archives of the comprehensive planning process remain on-line here, including early drafts of each element of the new plan, summaries of public participation, details of the adoption process, and amendments to the plan up until the 2005 evaluation and appraisal report. Application 2010-01-MAP: Amend the Future Land Use Map to change the designations of 821 and 831 Estero Boulevard from Mixed Residential to Pedestrian Commercial, which was approved by Ordinance 10-02. Application 2010-02-TEXT: Annual update to the five-year schedule of capital improvements, replacing page 11-28, which was approved by Ordinance 10-07. Click here for replacement pages to update a printed copy of the entire plan. 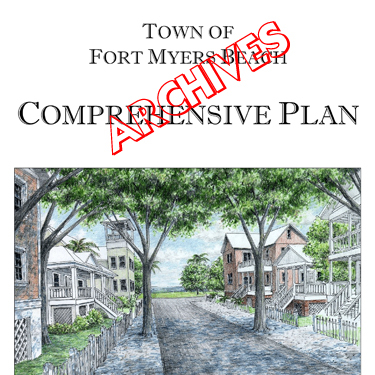 During 2008 and 2009, thirteen separate amendments to the Fort Myers Beach Comprehensive Plan were considered and adopted. All of these amendments were initiated by the Town of Fort Myers Beach after completion of the Evaluation/Appraisal Report, which was adopted in January 2007. Application 2008-02-TEXT: Add a new Public Schools Element to the comprehensive plan and make corresponding policy changes to the Intergovernmental Coordination and Capital Improvements Elements. Application 2000-2-TEXT: Reconsidering the plan’s Chapter 15 provisions for guaranteeing perpetual development rights on substandard platted lots.